Podcast emailed to you along with Slides and Handouts so you never miss one. You get them to listen to at your convenience. Weekly Webinars are hosted live every Wednesday at 6:00 PM Pacific and you will always receive the replay with all slides and handouts via email if you cannot join live. You get to pick and choose from the Weekly Topics! Janine shares her nuts and bolts approach to getting your home based Network Marketing Business started right. Includes the basics of how to set up yourhome office, what systems to put in place and what to do first and why. The secrets Janine used to make and break recruiting records in this entertaining program recorded live at a Home Business Training School in Canada. Order this Inspirational, instructional programand you will see dramatic results in both your business and bottom line. Order now and you will also receive Janine’s workbook that provides you with her personal success formula and action checklist. A Program to show how you can get endless energy & joy in your life! If you knew there were a few simple habits you could change that would dramatically increase your personal energy and power, would you? 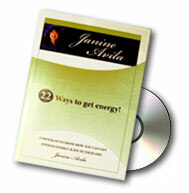 22 ways to get Energy is a program that guarantees results. Janine Avila not only inspires you with her simple down to earth coaching that you can listen to over and over, but then drives it home as purchasers of this program receive a 2 part Tele-Course. Janine is then able to monitor progress, encourage and answer questions. Program includes 2 Tickets to the 2 part Tele Course. Just pay $7 shipping and handling. Most people understand the value and results that can be achieved when we hire a personal coach or trainer. This has been the secret to athletic excellence for years. Janine is available for one on one coaching. Have a conversation with Janine and she will work with you to develop a plan and give you the strategies and know how to finally achieve your goals and conquer procrastination. She is a master at helping others learn how to balance and family and a career. Her down to earth fun no nonsense style coupled with more than 30 years of business experience can benefit you. Call today and set up an appointment to see how Janine can help you to grow and profit and most importantly, enjoy your life and business again!